Suburbia presents the listener with significant and necessary musical progression from The Upsides while maintaining The Wonder Years’ identity and selling points. Dan “Soupy” Campbell’s trademark vocals, while still extremely personal are notably less whiney and set farther back in the mix than they were on The Upsides, a production decision that reflects the band’s consideration of the place of the vocals as more of a compliment to the music, rather than the centerpiece. 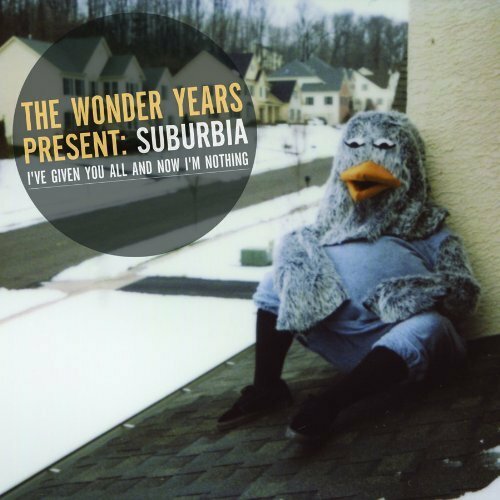 This time around, though still a defining aspect of The Wonder Years’ sound, Soupy’s vocals are not the only aspect of the music that is worth giving any real attention to. Though still power chord driven, The Wonder Years have vastly expanded the depth of their sound through clever orchestration and more varied songwriting. The Upsides was for the most part one dimensional in its sound, each song being fast paced with simple strumming patterns and little deviation from octaves and power chords. Suburbia features much more variation and far more mature songwriting. Mike Kennedy comes through with fantastic drumming that really sets the band apart from its peers. Were Suburbia to have come from a no name band, I can say without a doubt in my mind that the same praise would have been received for this release. While Suburbia is unquestionably better written than The Upsides, The Upsides is ultimately a more emotionally significant and relatable work than Suburbia is, and therefore is objectively the superior album. The Upsides found Soupy in limbo and unhappy with where he was; the honesty that was poured into the album is almost tangible. Suburbia finds Soupy much more comfortable and content with the direction of his life, and the vibe of Suburbia reflects just that. Soupy has less complaining to do on Suburbia and in the end Suburbia is more fun than its predecessor. It is hugely important that the band chose to go in this direction emotionally on this record as opposed to forcing something that wasn’t the reality of their lives in an effort to compete with The Upsides. Suburbia is just as honest as The Upsides is, it’s just that at the time of writing The Upsides, The Wonder Years was in a state of distress, questioning their commitment to the band, to touring, to music. Suburbia finds The Wonder Years signed to Hopeless Records, and with the financial resources of Hopeless, The Wonder Years can rest more easily at night. This ultimately is the reason that from the start, The Wonder Years could not outdo The Upsides. It almost saddens me that I spent most of this review comparing one album to its predecessor, finding faults by lining each piece up next to its respective component. However, it is important to note that I have been comparing Suburbia to an album that topped countless Album of the Year lists in 2010. Each album is spectacular in its own way, and I’m sure that though inevitable, The Wonder Years doesn’t even want the two to be compared. They are both unique in their own way and, despite the frequent Upsides references scattered throughout Suburbia, they function almost entirely independently of each other. Suburbia I’ve Given You All and Now I’m Nothing truly is worthy of all of the praise that it has received from the various major music outlets and leaves me both very satisfied and giddy with excitement for what is to come next. 3. "Local Man Ruins Everything"
5. "My Life as a Pigeon"
6. "Summers in PA (feat. Dan O'Connor and Alan Day)"
7. "I Won't Say the Lord's Prayer"
9. "I've Given You All"
10. "Don't Let Me Cave In"
11. "You Made Me Want to Be a Saint"
13. "And Now I'm Nothing"
"Suburbia finds Soupy much more comfortable and content with the direction of his life, and the vibe of Suburbia reflects just that." So, was this review ironic or something?